Got the chills? Not to mention it’s raining, it’s pouring in Sydney but that’s no reason to stay at home with Garfish’s range of hearty, delicious winter dishes on offer. Our new winter menu promises a selection of tasty meals to warm and comfort. 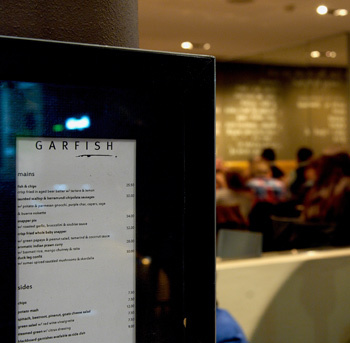 From spicy, aromatic curries and risottos, delectable gnocchi, scallops and sardines, there’s something for everybody. And of course we haven’t forgotten the obligatory comfort desserts and our choice of puddings is sure to have you leaving room! This rustic dish takes its inspiration from an Italian preparation loosely translated to ‘fish in crazy water.’ It’s not as crazy as it sounds though and our chef, John’s, interpretation of it will be sure to leave a memorable impression. The combination of little pink snapper braised with the tomato, spinach, capers and sea salt is both tasty and charming, and will have you forgetting how cold it is outside. Yes, this dish is as good as it sounds. The chipolata sausages are a Garfish creation made exclusively on-site blending scallops and barramundi together with a fish mousse, the result being a succulent and delicious treat you’re unlikely to have experienced anywhere else. Not to be outdone, the gnocchi is also created on-site. Their moist, pillowy texture is layered with the simple flavours of beetroot leaves, capers and sage. We think it’s one to remember, come and see what you think. 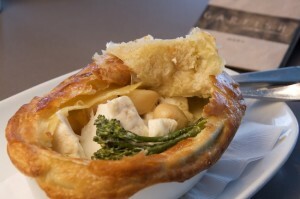 Our Snapper Pie – always a favourite! And of course, winter wouldn’t be winter if we didn’t remind you about a Garfish favourite – our infamous snapper pie with roasted broccolini, garlic and soubise sauce. It’s a winter staple for fish lovers! Each of our restaurants has its own unique slant on a common theme, read more about the individual winter menus for Manly, Kirribilli and Crows Nest here.